Maria, left, says she resisted the sexual advances of a Guatemalan supervisor at Agriprocessors. Her sister Yolanda, right, started working at the plant at age 16 and asked not to have her photo taken. POSTVILLE, Iowa (JTA) -- As the country's largest kosher slaughterhouse scrambles to stay open after a federal raid, former workers at the plant -- many of them still fearful of retribution from government authorities -- have begun to tell their stories, revealing new details of conditions there. Agents in the May 12 raid at the Agriprocessors plant in this small northeastern Iowa town arrested 389 illegal workers, among them 18 juveniles. In recent days, former employees have been painting a picture of a company indifferent to federal laws prohibiting slaughterhouses from employing workers younger than 18 and where workers frequently were pressured to exchange sexual favors for preferred treatment. At least one lawmaker, U.S. Rep. Bruce Braley (D-Iowa), reportedly has said he supports an investigation into conditions at the plant. Following what the government is describing as the largest workplace immigration raid in U.S. history, Agriprocessors denied any wrongdoing and insisted it would cooperate with federal officials. The company has remained tight-lipped about the latest allegations by former employees. "As with any legal matter, Agriprocessors cannot comment about any specific allegation," said Chaim Abrahams, a company representative. "The company is performing an independent investigation and will continue to cooperate with the government about this matter." Founded in 1987 by Brooklyn butcher Aaron Rubashkin, Agriprocessors has grown into the country's largest seller of kosher meat, producing some 60 percent of the kosher beef and 40 percent of the kosher chicken in the United States. The company -- which sells its kosher meat under various labels, including Aaron’s Best, Aaron’s Choice, Rubashkin’s, European Glatt, Supreme Kosher, David’s and Shor Habor -- has been dogged by allegations of worker mistreatment, environmental offenses, and food and safety violations at its flagship plant. With nearly half its workforce in federal custody, and many others having fled or afraid to show up to work, Agriprocessors has struggled since the raid to replenish its ranks. Workers have been shipped in from around the country and several former Postville employees say they have been asked to return to work. One ex-worker, who would identify himself only as Jose, said a female Agriprocessors employee had called his home looking for a man named Miguel. Jose told her that Miguel had been arrested in the raid, but the woman encouraged him to tell his friends that the company was looking to rehire workers. "She said don't worry about" having the proper papers, Jose said. "You can come to work and we’ll pay in cash." Another worker who refused to give her name said a supervisor had called her house Monday and said the company had a list of people it wanted to rehire. Her name was on the list even though she admitted to having purchased forged identification and a fake Social Security number. Agriprocessors also has recruited workers from its plant in Gordon, Neb., 650 miles to the west. John Marshall, 19, had worked in the Gordon plant for six months before boarding an Agriprocessors bus for the 12-hour ride to Postville. At the Iowa plant he worked 17-hour shifts in several capacities, from flanking on the kill floor to cleaning. Marshall says the company promised a $200 bonus for coming to Postville, as well as reimbursement for expenses, a place to sleep for free and an hourly wage of $8.25. After six days, Marshall said, he wanted to go home, but the company wouldn’t pay him anything beyond the $150 he received May 16. Marshall told JTA that he has no money to make the return trip to Gordon. Angelo Morales, 23, who drove himself from Gordon to Postville, said he was not reimbursed for expenses incurred along the way. Morales said he cannot afford gas for the return trip and is waiting for his girlfriend to send him money to get home. Meanwhile, former workers at the Postville plant are speaking out about alleged conditions there, often at the prompting of union officials that have flooded the town in the wake of the raid. A girl who would agree to be identified only as Yolanda said she was 15 years old when she left her home in Iztapa, Guatemala, late last year and illegally crossed the U.S. border into Texas. Within weeks she had arrived in Postville, where she found work in the Agriprocessors plant. Yolanda told JTA that she produced a fake government ID card that showed her to be 18 years old. She pulled 11-hour graveyard shifts bagging chicken breasts and removing turkey feathers -- difficult work that she said led to a hand injury from constant use of scissors. Supervisors routinely pressured the workers to move faster, she said. "They were constantly pushing us and forcing us to work faster," Yolanda said through a translator. "They were very abusive, screaming a lot." 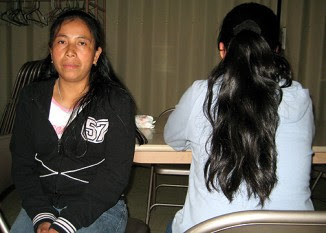 Yolanda’s sister Maria, 32, said she resisted the sexual advances of a Guatemalan supervisor who tried to force himself on her in a car. In the days that followed, Maria, who describes herself as a diligent worker, was accused of coming late to work and was denied overtime pay. "I like to do my job correctly and I like to do things a particular way," she said. "It's very different than some of the other workers, the way they do their job." Maria eventually complained and the supervisor was fired. But other workers appeared to keep quiet about alleged mistreatment out of fear they would be turned over to the authorities. "There was such fear in that community that they were afraid to go talk to anybody," said Kevin Williamson, the international vice president of the United Food and Commercial Workers union. Joel Rucal said he went to work at Agriprocessors after finishing the eighth grade. He said he paid $150 for a fake ID and took a job paying $8.75 an hour to work in quality control. Sometimes he worked 12-hour shifts through the night checking the temperature of the meat. According to Rucal, his 16-year-old girlfriend worked at the plant cleaning chickens, as did his sister, also 16. Rucal said that a supervisor told his sister that if she became his girlfriend, he would reward her with a promotion. "She said no," Rucal recalled. "And when she said no, he give more jobs to her." Rucal also said that he was pressured to purchase a blue Ford Focus from a supervisor for $3,500 after the supervisor promised he would make work easier for his mother, an Agriprocessors employee who was picked up during the raid. Rucal said she was released because she has children. Even as complaints and allegations mounted about the conditions at the Postville plant, the substitute workers brought in from Nebraska described a more positive environment back at the company's factory in Gordon. Morales said the Postville plant is far worse than what he experienced in Gordon, where supervisors would take the time to explain proper procedures or help out when something went wrong. In Postville, he added, supervisors only paid attention to the workers when they were taking a break -- to make sure it didn't last too long. "It’s not all rabbis; there are rabbis that are good," Morales said. "The Jews back home" at the plant in Nebraska, "they're like real people, real good people. But these Jews over here they’re different, real different."